I am incredibly happy with this hilarious and thrilling video. It starts off funny and weird, everything that we have come to know and love from Robert Downey Jr.’s Tony Stark character. Although there isn’t a lot of new footage that we didn’t see in the teaser earlier this past week, I am still quite content with what we do learn. We do get to see the way his new armor opens-up as he lay in the snow, battle weary and bruised. We once again get a quick look as Don Cheadle’s James Rhodes is wearing the new Iron Patriot armor and a quick upshot of Guy Pearce’s Aldrich Killian appearing to step out on a platform. Now to the meat and potatoes of the new footage; we see the infamous Mandarin (Ben Kingsley) with a voiceover as there is an explosion on an airplane that turns out to be Air Force One. As the passengers are sucked from the plane, Iron Man must quickly assess the situation and with help from his trusty computer Jarvis (voiced by Paul Bettany), he is made aware that there are 13 people plummeting to death, and his suit only has the capability to maintain flight while holding four! We all know that regulations and computing be damned, under no circumstances would Tony Stark take the easy way and let others die. This just might be a small glimpse of what’s to come, but if it is any indication of the edge-of-your-seat action we are going to see throughout the movie, then I say bring it on! So far, everything I have seen for “Iron Man 3” has impressed me and been a relief after the mish-mash disaster that “Iron Man 2” back in 2010. I know Marvel is moving into its “Phase 2” of films and I couldn’t be happier with all of the details I have been hearing (and seeing). While I still believe we need a full two and a half minute trailer that showcases and teases all of the new characters we will be seeing in the film, these tiny scraps of new footage here and there will assuage my excitement and anticipation for now. “Iron Man 3” will be flying into theaters May 3 and also stars Gwyneth Paltrow, Jon Favreau, Rebecca Hall, William Sadler and James Badge Dale. 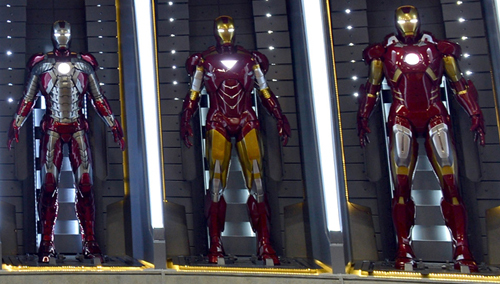 Tags: "Iron Man 3", "Iron Man", Ben Kingsley, Don Cheadle, Guy Pearce, Robert Downey Jr.